When hubby decides to cheat on his diet I always like to do it up big. This time we had a weekend away and his diet took a backseat. Once home I decided to make the most of it before he jumps back into Keto tomorrow, and I tried out a new recipe. His favorite breakfast is biscuits and gravy, I don’t get it, I can’t do soggy bread personally. However, he loves it, which means I love to make it. This bite size version is perfect! Less mess and so much easier to eat. It would be perfect for brunch or entertaining. Anything you can grab and go with is always a crowd pleaser. Preheat your oven to 350 degrees. 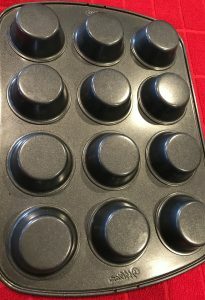 Flip your mini muffin tin upside down, spray very generously with nonstick cooking spray. Take your biscuits out of the can and flatten them out a little bit. 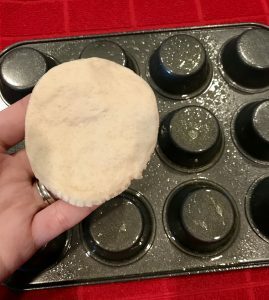 You’ll then press your flattened biscuit dough over the bottom side of the mini muffin tin. Bake for 10-12 minutes or until a light golden brown. While the muffin cups cook, its time to start your filling. Over medium heat in a large frying pan, brown your sausage and break it up into small pieces. Once cooked through, set aside. In another frying pan, melt butter over medium heat, then whisk in flour, this will make your roux, the base for your gravy. Once combined, slowly whisk in your milk a little at a time. I usually add in 1/4 cup intervals. Let your mixture bubble and thicken a little, about 2-3 minutes should do. Don’t let it brown. Now stir in your sausage mixture in all it’s yummy juices. Lastly pour in your maple syrup and turn the gravy down to the lowest heat setting. Once you take out your muffins cups they may have stuck together, just gently separate them with a butter knife. 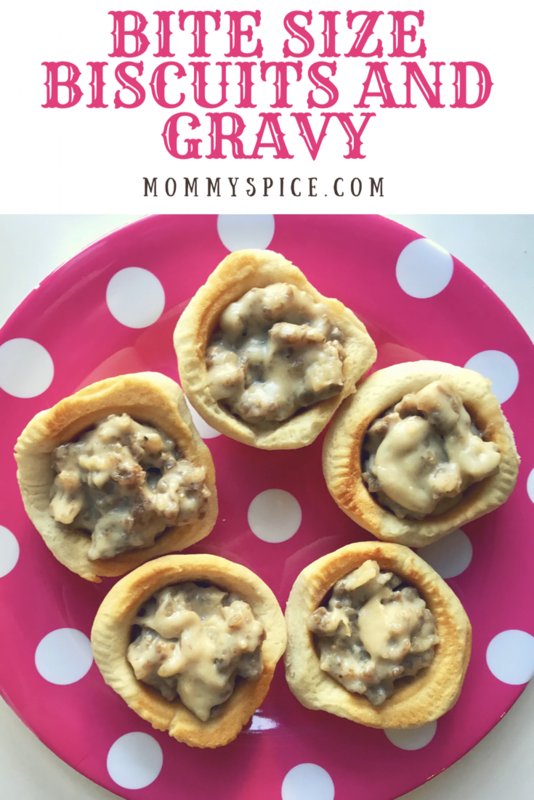 Fill each cup to the top with your sausage gravy mixture and put them back in the oven for 3-5 minutes to warm through and let everything combine. Once done, serve hot and enjoy! I took a lot of pictures for this one, so bear with me guys, it’s a lot easier than it looks. I just wanted to be thorough. 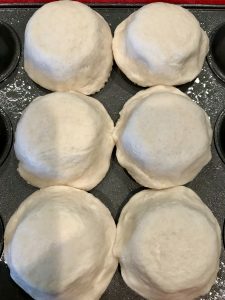 Here is the flattening of the regular size biscuit dough and how to form it around your upside down mini muffin tin. Once cooked they’ll come out looking like this, mine stuck together a little but came apart no problem. Once flipped over you have these perfect little cups! My head is already spinning with all the possible things I could fill these with. 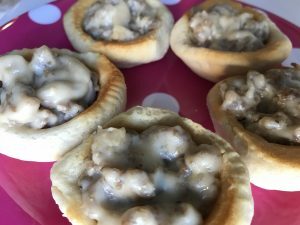 I was so intimidated the first time I tried to make these biscuit cups, but they’re actually super easy. Be sure to spray your upside down muffin tin really well and you shouldn’t have any issues. The big secret to this dish is not only is it cute and easy to eat, but the maple flavor. It takes such a well known comfort food and really elevates the flavor, yet still keeps it a breakfast. 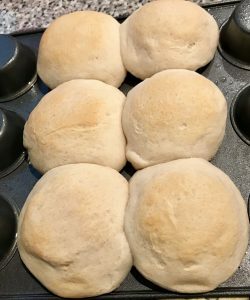 My tip for this one is to be sure to use regular biscuits, any jumbo, grands, etc will leave you will too much dough and your cups won’t come out the way they should. 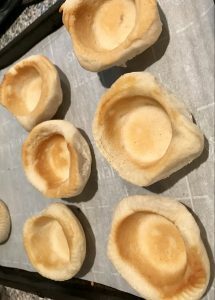 One last fun tidbit, once mastering these biscuit cups, which won’t take long, you can fill them with just about anything! !